Halloween is right around the corner! I hope you have your pumpkins carved and your spider webs out. I know we sure do. Boy’s pumpkin this year is of Oogie Boogie and mine is a simple little owl. We also have some cool ghost window gels, a pumpkin shaped table runner, two tiny ceramic jack-o-lanterns, and some other fun things out to celebrate. But the most important thing? Well, of course that’s a Halloween inspired Toas-Tite. Two years ago…we failed at posting our Halloween Toas-Tite recipe on time. This year, we’re not only righting that wrong, we’re also making the meltier, delicious-er version since Reese’s are designed not to melt. So grab your fudge sauce and your peanut butter and try this homemade pudgy pie to get your Halloween candy / Reese’s fix. And you can definitely have some extra Halloween candy on the side. Plus if you’ve recently made a “dirt” pudgy pie, you can use some of the same hot fudge sauce! Two sweet Toas-Titey birds with one stone. Start by buttering one side of each slice of bread. Alternatively, you can coat the inside of your pie iron with non-stick spray if you prefer. Place your bread into your grill (buttered side toward the metal clam shells, if you went that route). When considering bread, we always recommend white bread for sweet Toas-Tites and the flavor doesn’t detract from the filling. For ours, we used a honey whole wheat which has just that hint of sweetness. Dollop half of your fudge sauce onto on slice of bread. On top of that add the peanut butter and finish it off with the rest of your fudge sauce. Place the second slide of bread on the filling, close the pie iron and trim the excess bread. Toast for 2-3 minutes on either side over high heat or until the desired toasty level is reached. While you’re waiting, spread some more peanut butter and fudge sauce on your bread bits for a snack. Remove the sandwich from the grill and get excited. But! You’ll need to be patient with this one since the peanut butter and chocolate can get super hot inside. The ratio of chocolate and peanut butter in a Reese’s candy is generally lower on the chocolate, higher on the peanut butter. Because of that, we did the same for our pudgy pie. However, take any liberties you’d like modifying the quantities to get the choco-peanutty blend you desire. 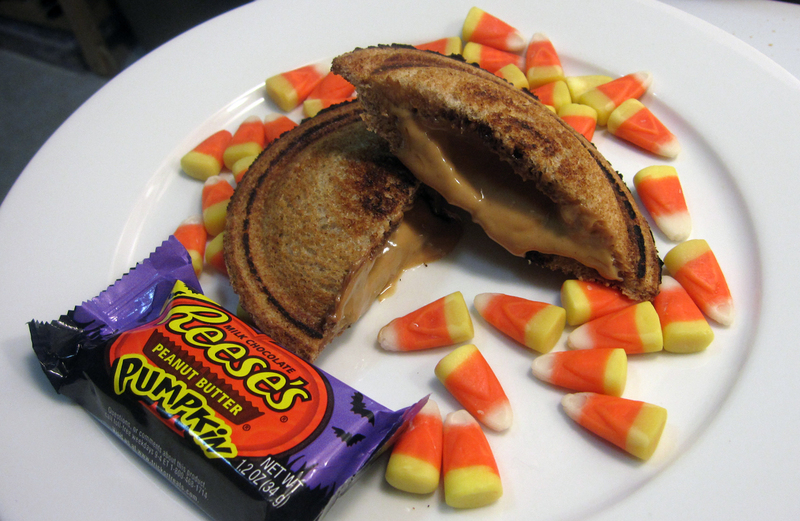 Now, the real question is…what’s your favorite Halloween candy and what would go in a pudgy pie version? !